​Joey Bravo, aka “L.S.D.” was born and raised in Ventura, California. Way back in elementary school he began writing creative literature & poetry, which later transcended into rap. But it wasn’t till High School that he met his friend Justin Russel who opened his eyes to the true art form & culture of hip hip. It was then that they created the crew Los Filthy Hooligans to represent the 4 elements of Hip Hop (The Dj, The Emcee, The B-Boy, The Graffiti Artist). After High School Joey & his friends started their own paths in life. Joey joined the Navy & lost contact with most of them. There he traveled the world Hawaii, Thailand, Singapore, Hong Kong, Dubai, & more. When he got out of active service he promised his mom he would visit her in Idaho where she now lived. While in Idaho he began to search for others who shared the same interest of hip hop. That’s when he met Yung Skillz. He spoke of his times back in California and his crew “Los Filthy Hooligans” and it was the idea of both to resurrect the name as a rap group signing with R.U. Down Entertainment headed by Latin Hip Hop pioneer M.A.G. of Brown Ecstasy. They became well known in the area. Later Joey & Yung Skillz decided to start working on solo projects, so the group went into hiatus. While in the group’s hiatus Joey continued touring & performing with his new group illest*Lyricists as well as performing solo. He has shared the stage with Pitbull, LL Cool J, Ying Yang Twins, Nappy Roots, Gift Of Gab, Akwid, Wrekonize, 2Mex, Scarub, and many more. Now you can say Hip Hop is Joey’s first love, but the radio waves are what runs through his veins & fuels him! His fascination with Radio began in High School as well. He would record impersonations on tape for his family and act like it was a radio show with various characters. His cousins would always ask for more, so while he worked on music he also created parodies & characters to entertain his friends & family, only dreaming of being able to host a real radio show one day…So you might say it was destined that he move to Idaho & win a contest in 2005 to become a Dj on The Music Monster (that’s a crazy story in itself). His original contract was to work the the night shift for the summer (3months only), but destiny had other plans…. All the hard work has definitely paid off because Joey Bravo became Program Director in 2012, just 7 yrs after he won the contest to become a DJ. 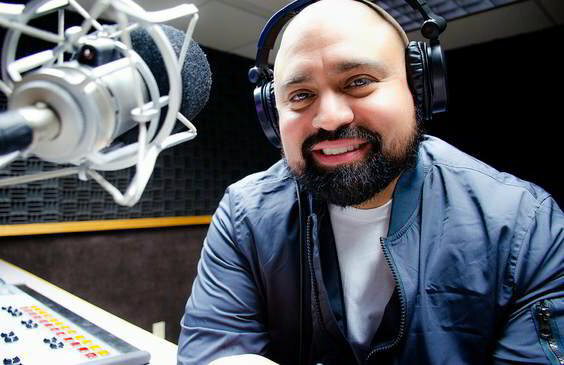 The Music Monster 92.7 is now the #1 Radio Station in the Magic Valley and he has also become Co-Ceo of R.U. Down Entertainment, Artist Manager & Promoter. Plus he has also created a radio show “Rollin With Bravo” that is dedicated to showcasing upcoming indie artists all over the Northwest & more. Its Something he has always wanted to do since he knows the struggles of an aspiring artist and the dream of being heard over the radio waves by many….So what else can you expect from Joey Bravo? …A lot more!